What should I do if I want to observe bacteria? They are small: In order to see their shape, it is necessary to use a magnification of about 400x to 1000x. The optics must be good in order to resolve them properly at this magnification. Difficult to focus: At a high magnification, the bacterial cells will float in and out of focus, especially if the layer of water between the cover glass and the slide is too thick. They are transparent: Bacteria will show their color only if they are present in a colony. Individual cells present on the slide are clear. Regular bright-field optics will only show the bacteria if one closes the condenser iris diaphragm. This is due to the difference in the refractive index between the water and the bacterial cells. Difficult to recognize: An untrained eye may have problems differentiating bacteria from small dust and dirt which is present on the slide. Some bacteria also form clumps and therefore it is difficult to see the individual cells. Research organizations and advances amateurs use phase contrast optics to see bacteria. This system converts the differences of the refractive index of the bacteria into brightness. 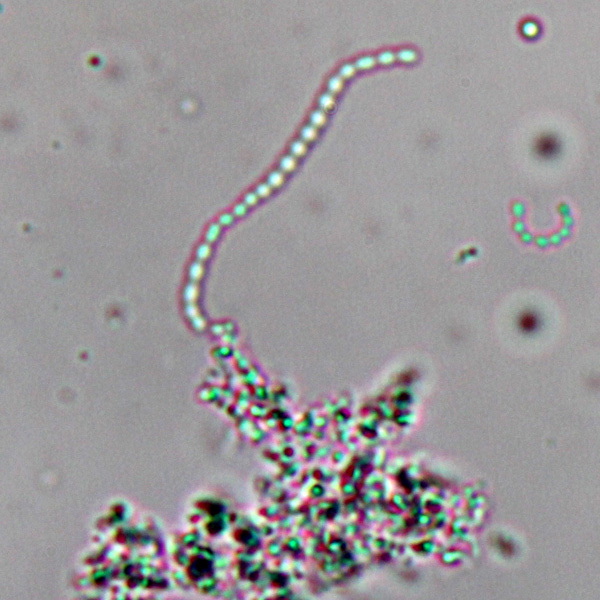 The transparent bacteria can then be seen dark on bright background. In bright-field, closing the condenser iris diaphragm will also make the bacteria appear darker, but at the same time one also introduces artifacts (“fringes”) around the individual cells. One possibility is to stain the bacteria, but in this case there fixing and staining process may introduce artifacts. In summary, the observation of bacteria requires patience and some practice, and a reasonably good microscope. For recreational or educational purposes, one should never use spoiled food or (heaven forbid!) use bacteria obtained from the human body and grown on agar plates. The risks involved are simply not worth it, especially when one is not familiar with basic aseptic technique. The legislation of some countries may actually forbid the growing of bacteria on agar plates in non laboratory conditions. Other sources, such as soil or humus have other disadvantages. The impurities make it difficult to keep bacteria from other particles apart, especially if one uses bright-field optics. It is also possible to buy bacteria in powdered form that are suitable for human consumption. Drug stores sell capsules or little envelopes with dried bacteria. These bacteria help to regenerate the digestive system. Some health shops also sell bacterial starter cultures for the making of yoghurt. Take a small knife-tip of these cultures and dissolve them in a few milliliters of water for microscopic observation. In my view, there are easier (and maybe also more interesting) specimens to observe than bacteria. I you want to see individual cells, then I do recommend to beginners to first observe yeast suspensions. These eukaryotic cells are much larger and can be more easily seen. 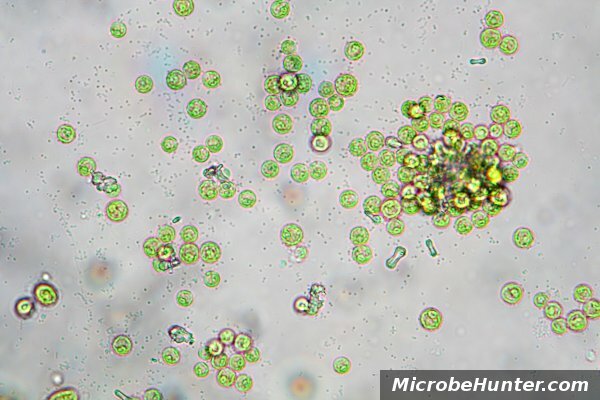 Large green algae (eukaryotes) and bacteria (prokaryotes) – the small dots. Yoghurt bacteria grow in long chains. How can camera vibrations be reduced?